How to create a playlist on youtube and share it across your devices and with friends. YouTube has millions of videos and songs and instead of searching every time what you want to see or listen, you can create playlists with your popular items and use YouTube like a jukebox! For more nice tips, visit our youtube tricks and tips page. 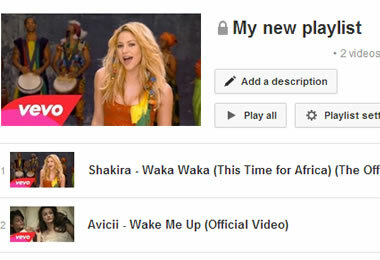 The first step for creating your own playlists on YouTube is to login to your Google account. If you are not logged in then you cannot save your lists or share it with other friends. Step 3: Once you find the video you want, select it to go the video page. Step 5: Either add the video to one of the existing playlists or create a new one by typing a name in the “Enter a new playlist name” box and clicking the “Create playlist” button. Note that by default the playlist you will create is public. If it is a personal list and don’t want to share it, select Private from the drop down menu. Step 6: Repeat the above procedure to add as many videos you want to your list or create new ones! To access your playlists click the playlists button from the left menu. If the menu is not visible you have to click the menu icon (next to YouTube logo in the top left corner). How to remove items from my playlist? To remove an item from your playlist you have to click the playlist name from the left menu (do not click the playlist button) and then move the mouse over the items and click the X button. The item is automatically removed from the list without confirmation. In this screen you can also control the order of the items in the list and several other settings. How to share my youtube playlist with friends? While in the playlist page, click the Share button. You can then send the list to friends by email, share on the different social media networks or embed the playlist in your website. How to access my playlists from mobile or ipad? The playlists are saved in your YouTube account so all you have to do to access your lists on mobile or Ipad is to download the YouTube app, login using your google account and select Playlists from the app menu. That’s how you can create and share playlists with your favourite videos on YouTube. Don’t forget that while watching or listening to a video you can use the fast forward button to increase the playback speed but still see or hear the video clearly.